The Customer Revolution: Amazing customer service from Flightcentre! I thought that I had written my last post of 2010. I thought that by this time I would be in New Zealand on my honeymoon. Sadly the weather, airports and airlines have conspired against me and, like 1m other travellers hoping to get away for Christmas, I’ve been stuck in London for the last few days waiting for a rescheduled flight. Having spent nearly 15 years working with Marketing, Sales and Customer Service organisations I’ve seen my fair share of good and bad customer experiences. A crisis is often the best way to stress test a customer-facing organisation; it can shake Customer Service to its core. It would be easy to write a post describing how over the last few days I’ve seen many examples of customer service organisations being totally unprepared for a crisis and delivering appalling service to their customers, but I wanted to take a moment to describe one of the best customer experiences I think I’ve seen. I’ve always said that its people that make the difference within Customer Service. Sure you can buy expensive technology (and that can help) but if your people are not motivated to help customers then your investment is probably wasted (see my previous post “Software doesn’t build relationships; people do”). People certainly made the difference in the recent chaos at Heathrow. 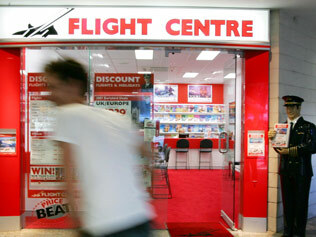 Let me take a step back and explain how Flightcentre dealt with the crisis. I had booked my flight with Flightcentre nearly 12 months ago and had been looking forward to going on honeymoon and catching up with old friends in New Zealand. The fact that I had booked at a high street travel agent at all (rather than direct online) had originally surprised me. But Flightcentre had been able to get me a much better deal than I could find myself online and Dave Lister, the manager at Flightcentre in Richmond had personally visited some of the destinations I was planning to go to and had made some great recommendations on hotels and restaurants. Fast forward 12 months and on Saturday evening I arrived at Heathrow to find what could only be described as total chaos. A sudden, heavy snowfall had brought the airport to a complete standstill and unsurprisingly I received a text message from my airline telling me that my flight was cancelled. Within 60 SECONDS of receiving that news my phone rang - It was Dave from Flight Centre. He remembered that I was off on honeymoon and phoned me out of office hours to check if I needed any help re-booking my flights. I was shocked. It would have been so easy for the travel agent to simply pass the buck on to the airline and ask me to deal with the airline direct. In the end we couldn’t find anything to re-book on Saturday night so Dave and his colleague Jois Christie came into their Richmond office on Sunday morning (their day off!) to help us (and of course their other customers) find alternative flights. In the end they spent around 2 hours with us working through different options until we found a flight that (I hope!) leaves tomorrow. Their knowledge, customer focus and passion for helping their customers was truly outstanding. I certainly won’t be booking my travel anywhere else in the future and I hope Flightcentre recognise what great people they have! My learning from this - you only get moments of customer delight within Customer Service when people make the effort to go the extra mile. Disclaimer and disclosure: Flightcentre have no idea that I write a blog on customer-centricty. They have not paid or incentivised me in any way to write this post and have not contributed anything to the content. A quick update! After another cancelled flight we had almost given up hope of going on honeymoon but Flightcentre came good again. Kathryn Kearns spent 4 hours (outside office hours) on the phone to Malaysia Airlines and managed to get us on a flight yesterday. We've just arrived in Kuala Lumpur which is fabulous! Many thanks again to Flightcentre! I think surprising and delighting customers with outstanding service is one of the most effective ways to grow a business. Thumbs up for those who gave good service! They deserve free publicity..
Wow, now that's quality service right there! That service pretty much sounds like they're a call center with an inbound call team for customer queries, and an outbound call team for updating the customers. The efforts shown by your travel agents are really amazing. I've never heard of such good service before. I wish that all travel agencies are like that.